Do your kids ask for a snack the minute they walk in the door after school? Mine do! Some days it feels like all they request are snacks. I figure if I am buying a bunch of snacks, I might as well buy ones that help support their elementary school. 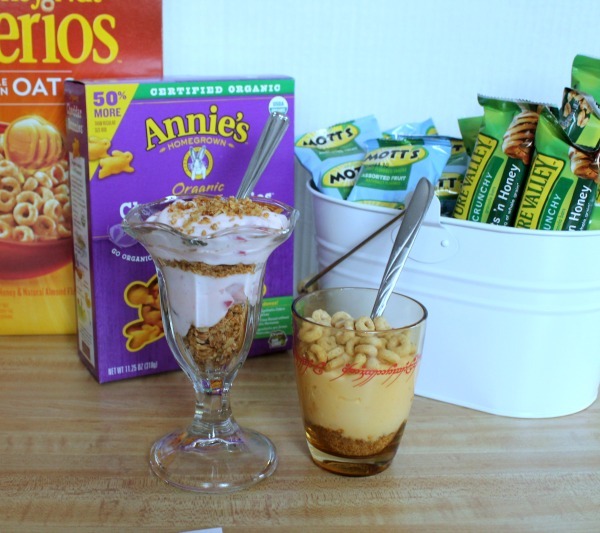 I also like to offer a variety of grab and go snacks as well as make them special treats such as this easy yogurt parfait. You know how some people get excited when they find change on the ground? I get excited about bonus Box Tops for Education. You laugh, but it's the truth! When I joined the PTO board at my kids' elementary school, I happily volunteered to be the school's Box Tops for Education Coordinator. That means I get to think of ways to motivate and encourage families to collect Box Tops as well as count all of them before submitting them. It's work, but I truly love it because I'm passionate about education and supporting my kids' school. Last fall, I counted over 4000 Box Tops! Clipping and collecting is a fantastic way for our families to help support the school, especially since many of them already purchase products with Box Tops. This month, I'm kicking off a friendly class versus class Box Tops clipping competition to help raise funds to update the playground. So what does all of that have to do with feeding my kids snacks? Well, a lot of their favorite snacks have Box Tops and I like to make those purchases go even further by using the Box Tops Bonus App. I absolutely love this app! 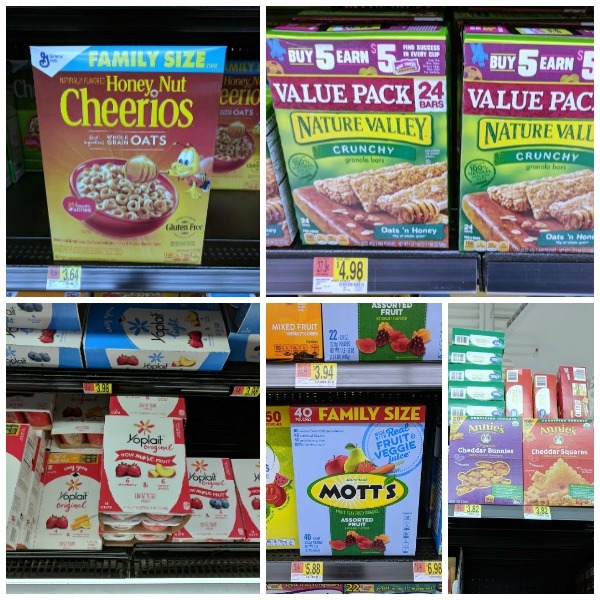 When I'm making my grocery list, I look through the Box Tops Bonus App offers and select the ones that fit with what I'll be purchasing. After I'm done shopping, I use the app to scan my receipt. Once my receipt processes, the bonus Box Tops are credited to the school's account. Then I clip and send them in like usual. I earned $5 with the Box Tops Bonus App offer PLUS I'll earn another $0.60 by clipping and sending in the physical Box Tops too! (The fruit snacks had two Box Tops.) That's right, buying those five products helped raise $5.60 for our school. I've encouraged families at our school to get the app because it's an easy way to earn even more Box Tops for Education. If you don't have this app yet, go download it from iTunes or Google Play! I added these to our snack cabinet but also wanted to make a special treat for my son and daughter. 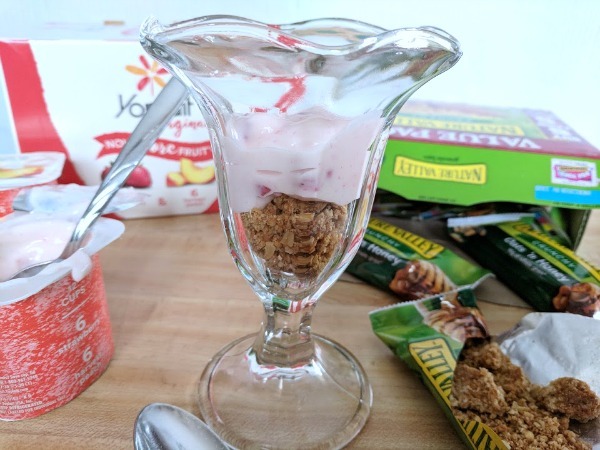 These yogurt parfaits are incredibly easy to make and the kids can create their own combinations. Start by crushing the granola bar by hand or with a rolling pin. 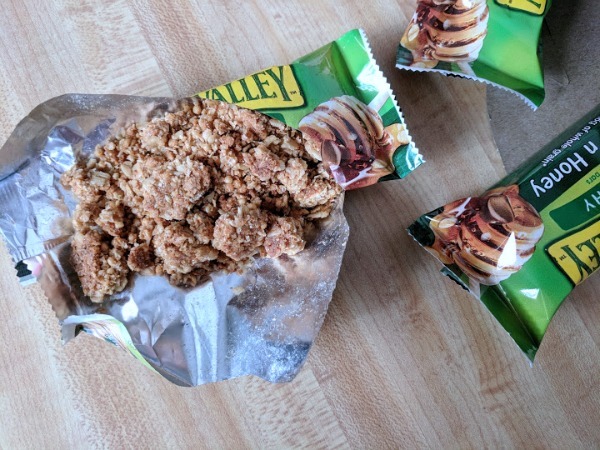 I crumbled it in the package. Then pour some of the crushed granola bar into the bottom of your dish – enough to cover the entire bottom. 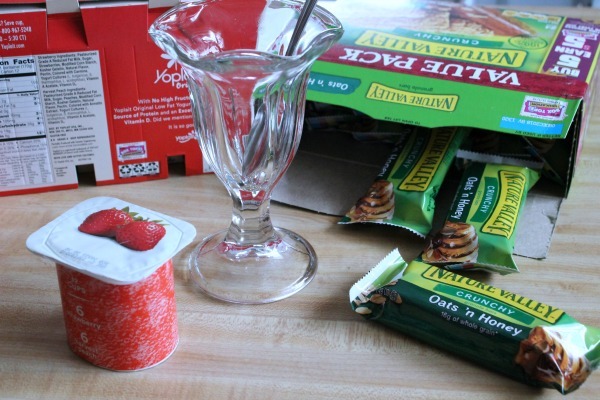 Add about half of the yogurt cup. Then add another layer of granola. Add the rest of the yogurt. 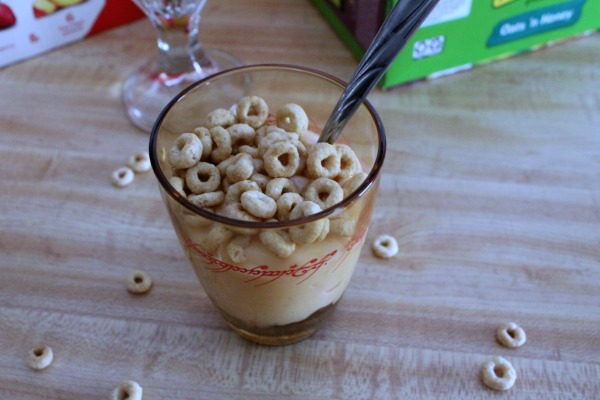 Top with more granola, Cheerios, and/or fresh fruit. The kids will love picking their own toppings. While the kids were enjoying their parfaits, I was clipping and adding Box Tops to our collection sheet. We hope you enjoy some tasty after school snacks while earning Box Tops for your school too! 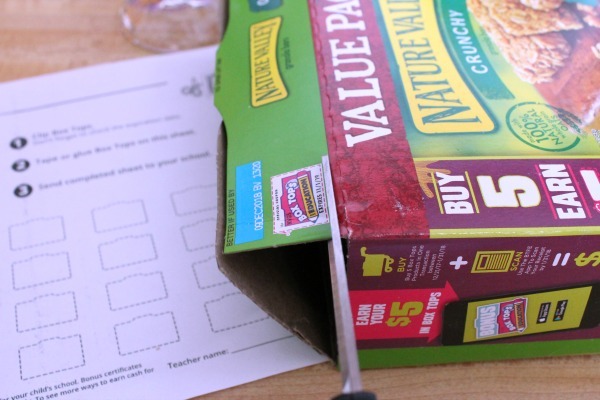 Crush the granola bar by hand or with a rolling pin. Pour some of the crushed granola bar into the bottom of your dish. Add half of the yogurt cup. Add another layer of granola. Top with more granola, Cheerios, and/or fresh fruit.